Thanks YM...Think most people go for the 3 in 1 Backrest which I like, had one on my 1st Scooter. Seems quite a few Mods like behind the Legshields, restricts legroom for me. I also usually have a spare wheel cover on, need to get a new one, nice to have a lot of different choices of style to get these days. On my sx I have one on the back and one in the legsheilds after many jaunts across Europe and GB ,doing nationals I always aired on the safe side,I am building.a series 2 at the moment and sourced a rare inline carrier but then this is being built for speed and more of a custom scooter,but for what looks the best on that back 2in1 rack nice Whitehall,wheel disc and nice spinner to Finnish off is mutts nuts personally. Good to see you on again Andy, hopefully catch up with you if you are going to Troon on the 2nd. I have always preferred the spare wheel on a 3 in 1 Andrew, especially if the tyre is a whitewall. 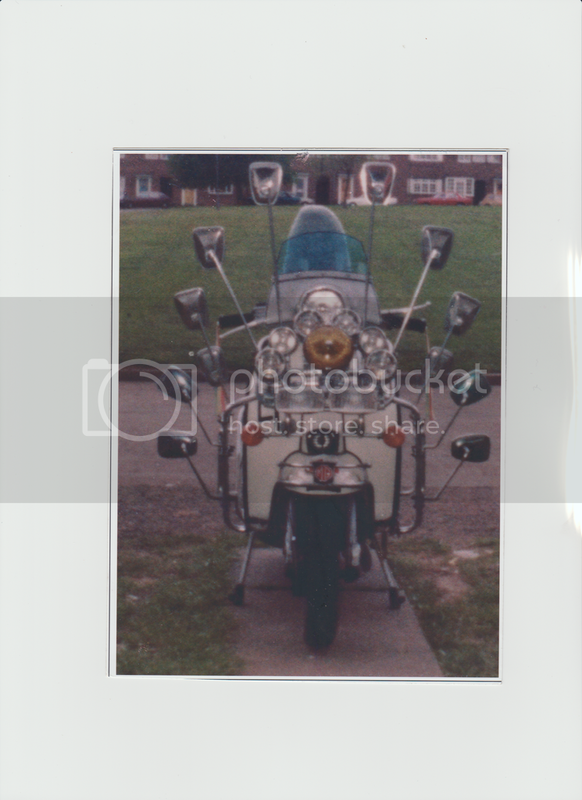 To me it is shown off better and is a fantastic addition to the classic lines of a lovely Vespa or Lambretta. Having it on the inside of the legshields looks good too right enough so it all comes down to personal opinion really. Good point Chris, on a modded scooter they look great, but they can throw off the lines on a classic I feel. Its always just going to come down to personal taste I think Graham. I don't think there is any rights or wrongs involved. Didn't put it there back in the day !! Thanks Guys, i guess it is staying where it is then. It took me a long time to decide on wether to go the full Mod route but sometimes less is more.